By Monica Lasky on January 14, 2019. Many Candid Critters citizen scientists begin working on the project by setting a camera in their backyard. More often than not, these deployments show squirrels, deer, raccoons, and other wildlife that many of us see frequently near our homes. Of course, this leaves us wondering how much wildlife like to use these suburban areas, and if there are species that are species that are able to use these habitats better than others. This is one of the thoughts on the minds of Candid Critters scientists as they set off to study the project’s data. In the figure below, there is a large disparity in the use of habitats of various development stages between several species. Developed habitats include areas that have a significant human presence, such as neighborhoods – in this graphic, the suburban (orange) and exurban (yellow) sites represent our ‘developed’ areas. As you can see, chipmunks and woodchucks tend to be found often in developed areas, while bobcats tend to very rarely be found near human development. Figure 1. The percent of detections for all species observed on camera traps captured in each development level along the suburban-wild gradient in Raleigh, NC. So why do some species use suburban areas, while others do not? There are several scientific theories behind this phenomenon. With mammals, the biggest factors are diet and sociality (tolerance of conspecifics). There is a lot of diverse and highly concentrated food in suburban areas, so those species that can eat a wide variety of items are more likely to occupy these regions. Furthermore, animals that don’t mind too much hanging out with other members of their species will do well in suburban areas, since the concentration of individuals in these dense locations tends to be higher. This makes sense as to why, raccoons – a species that eats almost anything and is often found hanging out with other members of its species – are much more commonly seen in suburban settings than, say, bobcats (a solitary animal that only eats meat). Other factors include size (smaller animals are more likely to inhabit suburban areas) and the amount the species is persecuted (such as hunting, trapping, etc.) by humans. Furthermore, some species have greater flexibility in their behavior, a trait known as phenotypic plasticity. Certain animals are able to adapt their behavior to certain environments or events, while other species are more ‘set in their ways’. 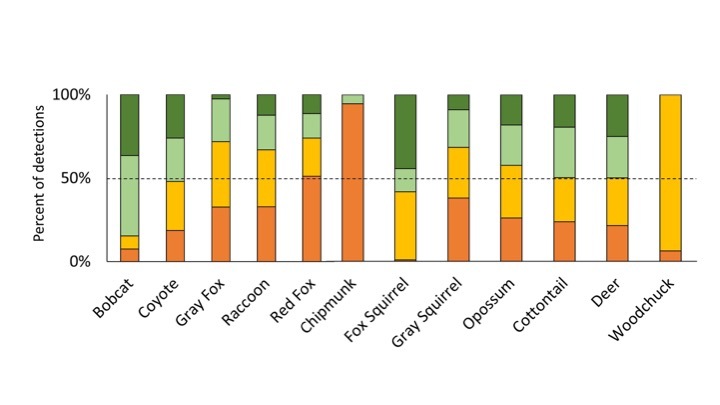 Thus, from our graph above, we can infer that chipmunks most likely have greater behavioral plasticity than bobcats, as they were more likely to penetrate the novel environment of the suburban landscape. Just like people, individual animals can display different personality traits. One common trait often looked at by urban wildlife scientists is boldness versus shyness. Individuals are said to be ‘bold’ if they are more likely to approach novel objects or areas, or are more likely to return to an area in which an adverse condition had previously been found. For example, if a white-tailed deer runs across a barking dog along a trail, the amount of time the animal takes to return to the same location will determine how shy or bold it is. If it returns in a day, it would be more bold than if it returned weeks later to the trail. The boldness characteristic is often believed to affect whether an animal is more likely to infiltrate an urban/suburban environment. In this sense, individuals who are more likely to move into suburban areas are those that have bold attitudes. It may be unsurprising to hear that animals that are more likely to inhabit human-developed habitats are, overall, less in danger to population decline than animals that avoid humans. As the human population grows, natural habitats are converted to developed lands, which means that animals unable to cope in developed environments have no choice but to occupy the few protected natural areas remaining. This is the main reason why many scientists are advocating for habitat conservation, as there are many, many species (such as bobcats) that are unable to live without areas that are untouched by human infrastructure. This is one of the main reasons why maintaining habitat cover and wildlife corridors between and within urbanizing areas is so important. You can have pile of food in the middle of your neighborhood, but if it is out in the open and hiding cover is not near, there are even many social and dietarily-broad mammal species that still won’t go there. Lowry, H., Lill, A. and Wong, B.B., 2013. Behavioural responses of wildlife to urban environments. Biological reviews, 88(3), pp.537-549. Parsons, A.W., Forrester, T., Baker-Whatton, M.C., McShea, W.J., Rota, C.T., Schuttler, S.G., Millspaugh, J.J. and Kays, R., 2018. Mammal communities are larger and more diverse in moderately developed areas. eLife, 7, p.e38012.